SOUTH MISSISSIPPI (WLOX) - For a moment, school attendance may seem slim on Wednesday as students nationwide ditch their desks and participate in the National School Walkout. According to event organizers, the students will not be out of class for long. The "#Enough" march will start at 10 a.m. and last for approximately 17 minutes, one minute for each victims killed last month in a shooting at Marjory Stoneman Douglas High School in Parkland, FL. Wednesday, March 14 will mark exactly one month since the fatal shooting. 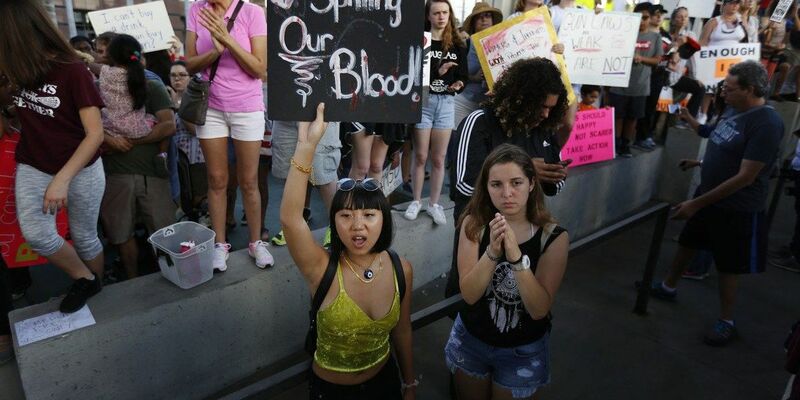 For many, the event will serve as an show of solidarity with Stoneman Douglas students and a protest with a push for stricter gun control laws. Pascagoula High School is listed as one of more than 2,500 schools in the U.S. registered for the walkout this week, as seen on the event's official website. A representative of Gulfport High School says the school will not participate, but will continue to show support by encouraging students to wear the Stoneman Douglas colors. The school will also observe a moment of silence from 8 a.m. to 8:20 a.m. In honor of National Youth Violence Awareness Week, Gulfport High School student council members will lead a week of activities to promote a message of positivity and a non-violence. Events will include a barbecue on March 21, where Principal Lindsay and others will cook up hamburgers and hot dogs at lunch. The council hopes the BBQ will send a positive message across the campus and bring students together.